So Thrive is a game I designed during my game-idea-a-day project, way back in 2016! 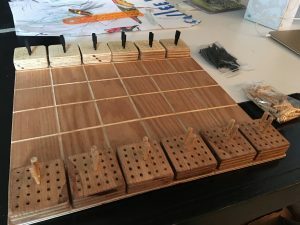 It’s a two-player abstract strategy game (which should surprise nobody), and the big innovation is that you augment the way the pieces move as you are playing the game. A little over a year ago it was picked up by Adam’s Apple Games, and just NOW, TODAY, it’s on Kickstarter. This is my first ever board game getting a print run of any size. I’ve been extremely grateful to Adam for taking me along on this ride, keeping me in the loop on many of the decisions along the way, and allowing me to be such a part of this project. Adam Rehberg and I both brought copies of Thrive in various states of quality. It was interesting to compare his 3D printed pieces to my own. (We are using a new model courtesy of local artist Colin Cody-Waters, and his printer does a better job with it than mine.) At this point, we are more in marketing mode than actual play testing, but we did have some new things to playtest. Worth noting that there will be a kickstarter for Thrive at the end of February, or beginning of March, and at least in part to collect email addresses for that kickstarter, there is a Thrive print-and-play contest going on right now over at Adam’s Apple Games. I managed to get a new “pyramid tile laying / fitting / stacking game” to the table several times. The tiles are (some of them) glued together in 1/4th overlapping shapes and patterns. (This is harder to describe than I realized.) I’ll include a photo of one of the end-game pyramids below, but you can’t really get a sense from the photo which tiles are actually glued together and which are singletons. The idea is that you use the singletons as currency to pay for the larger tiles. One of the last parts left to design was how to score the game, (though I had plenty of ideas), and I got lots of useful feedback on those ideas, as well as plenty of other helpful suggestions from my play testers. One of the games we ended up calculating scores for each player in 4 different ways. None of them fully met my criteria for how I wanted the scoring to incentivize building up rather than out, so I still have some thinking still to do on this one. Oh Tetrominoes! – just the blocks – I made a version of this game by gluing 1-inch cubes together (pictured below). It was easy to get to the table, because it just looks and feels really nice, I think. Adam gave me some great feedback about wanting a “qwirkle moment”. And someone suggested having blocking pieces. Next time I play it I want to try where only the three polygons score, and the spaces marked X are blockers. Notably, the game board (with score track) was the first and only thing I’ve ever created in Illustrator, only about an hour of work. Windrose – I did playtest this again at the convention. There were some new ideas thrown around. I sort of thought this was “done”, but the conversation left me bristling with ideas. I sort of feel like most of them would result in a different game entirely, but that’s not necessarily a bad thing. 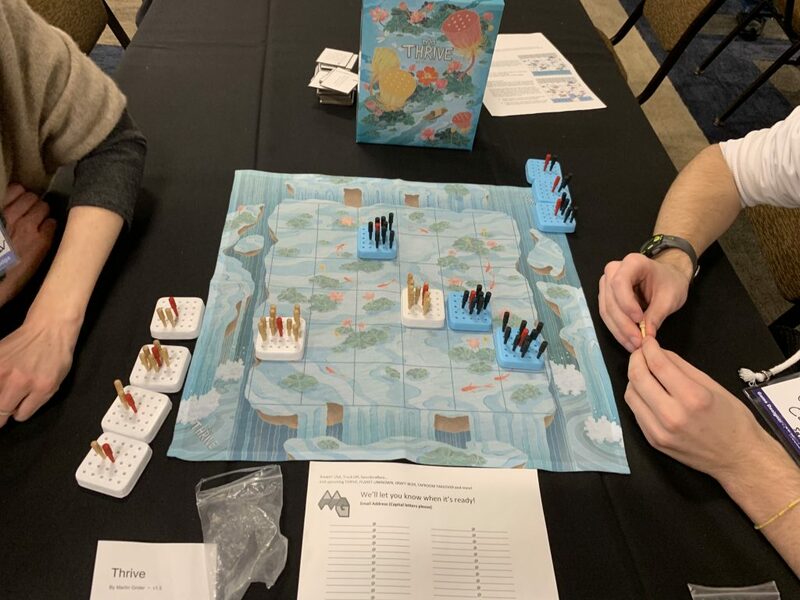 – My standout game for the convention was a numbers-heavy (but not at all otherwise heavy) strategy game by Patrick Yang. He’s calling it Mathemagical, which is a great name, and I really liked the game. 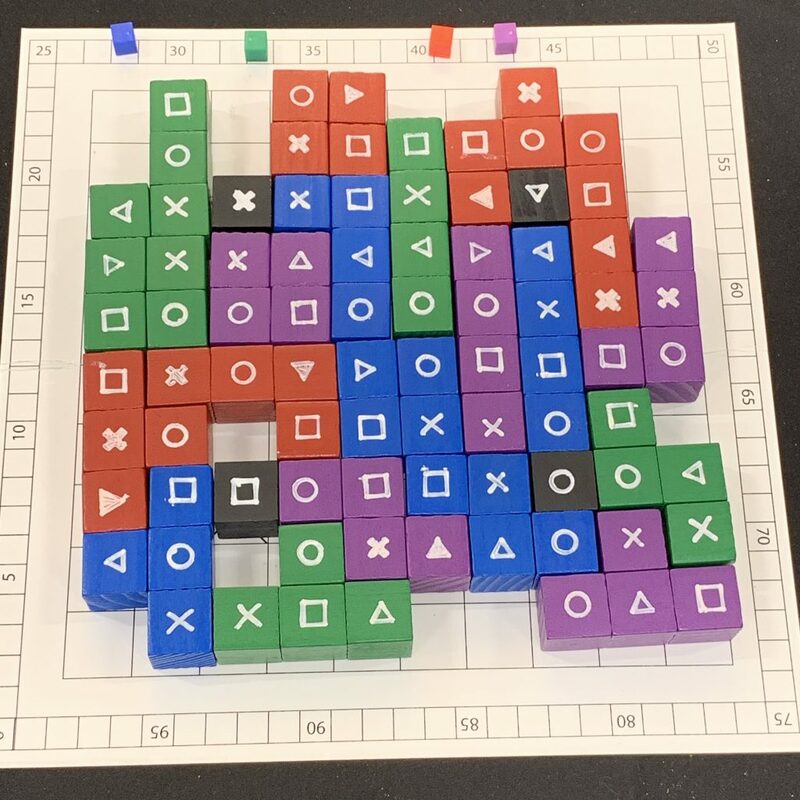 – I got to play a tetromino stacking prototype called Lots. It was light and quite fun. – My daughter attended with me on Sunday, and she ended up spending at least an hour (maybe two) prototyping a game in collaboration with another little girl who was there. I think they both really had fun, and there were even some neat ideas they came up with together. – Playing a couple of new-to-me Adam’s Apple Games prototypes. 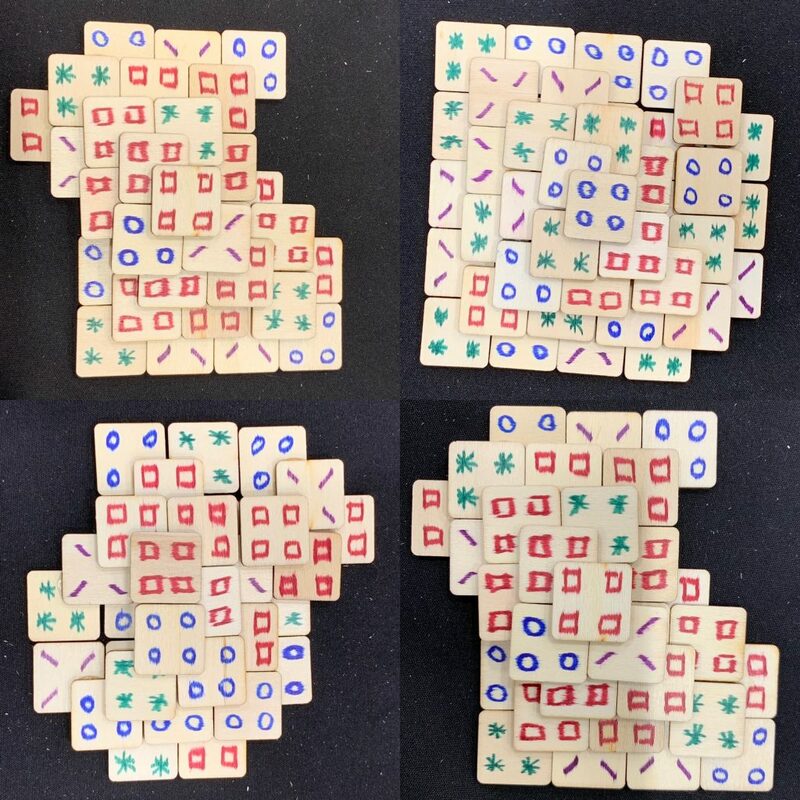 – A game played with “kite and dart” Penrose Tiles, which really looked cool. – Seeing, (but sadly not actually playing) Cartographers: A Role Player Tale, which looked like a contender for my favorite take on the emerging “Flip and Fill” genre that is hot right now. – Having dinner with Nick Bentley, who I have been acquainted with for some time, (I turned his game Catchup into an iOS app a few years ago), but until this trip might not have actually called a friend. We had such great conversations at dinner on Friday that we resolved to do it again on Saturday, and then I managed to convince him to play a couple of games late into Saturday night. There were way more games that I was interested in trying out than I actually got to sit down and play. I did play a lot of games though, and I hope I gave some good feedback. I’d say the ratio of playing my own games to others’ was probably 40/60. All in all, definitely a great event for me. I’d recommend it, and definitely hope to do it again. I’ve been thinking about criteria for reviewing abstract strategy games. In particular, I’d like to end up with a list of ratings, (not just one) that give the reader a sense of how the game plays in comparison to other abstract strategy games. 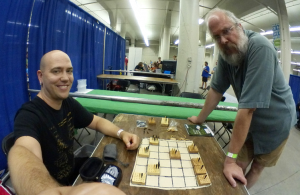 My goal, to be up-front about it, is eventually to start a new game review site, focused on abstract strategy games. That site’s mission will be: To promote and evangelize the beauty of abstract strategy games. Strategic complexity – How strategically complex? I.e., how far ahead can I think about my turns with any real expectation of implementing a specific strategy? Tactical Complexity – How individually complex are each of my decisions in a given turn? How many factors are there influencing my decisions based solely on the game’s state in a single turn? Rules complexity – How easy is the game to understand and begin playing? How well are the rules written? Game Readability – How easy is the game to understand at a glance? Can an experienced player take in the game’s state and gauge whether a player’s position is superior or inferior to that of their opponent? Game Depth – How deep is the game? This could mean a lot of things, but for my reviews, it will mean how much can experienced players be said to be playing at a “different level” from beginner players? Or in other words, how much do the game decisions made by an experienced player change versus the decisions of a beginner player? Spacial Engagement (Geometric Engagement?) 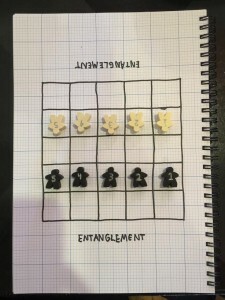 – How much does the game rely on the player visualizing the positions of game elements in relation to one another or in relation to imagined elements? Mathematical Engagement – How much do mathematical equations or general math principles (counting, etc.) play into the tactical decisions and / or long term strategies in the game? Originality – Have I seen games like this before? Do I feel like there are new ideas in particular that deserve calling out in this particular game? 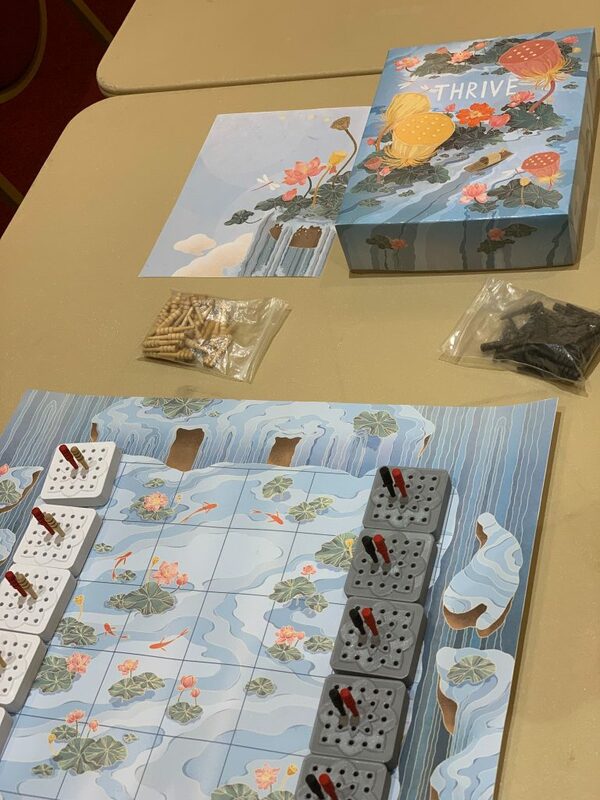 Physical Beauty – If this is a game played with standard components, or PNP, it may get dinged here, but since I am attempting to promote abstract strategy games to the general populous, it’s actually a super important criteria. Overall Elegance – This could be expressed dispassionately as a ratio of rules complexity to strategic depth, but I actually think of it more as an expression of my feeling of satisfaction with that ratio. Did playing the game feel like more than the sum of its parts? Did it inspire me to think about it? – Is there anything obviously missing? Are there other criteria you use when judging a new game? – How are the names? Any you feel should change or that you feel could be articulated better? – Is “Overall Elegance” even needed? It’s probably the most subjective, but the concept I’m attempting to capture is just how it feels to play, which is absolutely subjective. Is there a better way to say that, maybe one that doesn’t seem as subjective? – I’m thinking about doing a scale (probably 1-5) for each of these, and giving the game a score based on the sum total, or possibly an average. Thoughts on that final score? This entire thing essentially came about because I was thinking about the term “combinatorial game”, and whether I wanted to use it along with (or instead of) “abstract strategy game”. When thinking about a rating system for Abstract Strategy games, it’s a no brainer to indicate whether there are elements that fans of “pure” thinking games might not appreciate: randomization during gameplay, hidden information, player manipulation, and generally just anything that gets in the way of the player determining their win or loss through skill alone. Generally, this is why the combinatorial term came about. (Although some might argue that it came around the other way, from actual academic game theory, as it was definitely used there first.) But I feel like it was only co-opted by game designers because “abstract strategy” has been used too frequently in the board game industry at large to describe games that are only abstract in theme, and don’t meet the other criteria. If you visit the wikipedia page for abstract strategy, you’ll see the description carefully adds qualifiers like “almost all…” and “most…” or “many…” when describing the no luck and no hidden information qualities. It’s a controversial term. 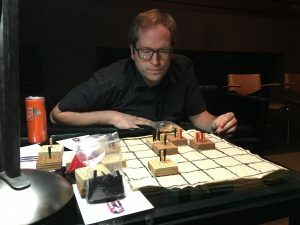 Back to my thought-process: Indicating the presence of any of those non-combinatorial elements in a review will be easy, but some games that contain one or more of those elements still feel like abstract strategy games to a greater or lesser extent to me. I want to be free to review those games, and also want to communicate that feeling and quantify it somehow in my rating system. But simply telling my readers that a game “feels abstract” seems too subjective, and also, it won’t give them enough information about whether they might also share that feeling. So I realized I’d need to break it down. Which led to the question: Why do games feel like abstract strategy? This led to my list of rating criteria. And somewhere in making the list, it occurred to me: All the issues of combinatorial (or not) being equal, I have the same problem when comparing two completely combinatorial games. Other than my personal feelings about them, how would Chess rate any differently from Go? I thought about it some, and that also influenced the list. (In particular, the addition of Spacial and Mathematical engagement.) As it says in the post, I’m definitely looking for feedback on all of this. Feel free to post a comment, or head over to BGG and join the discussion. 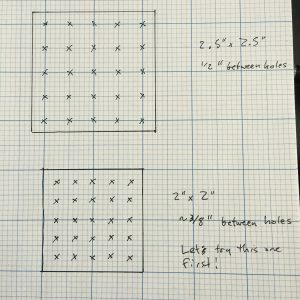 At least partially inspired by another BGG user’s lofty goal of 1 new pyramid game a month, around January 1st I had the even-more-ridiculously insane idea to make a goal of designing a new pyramid game for each game mechanic on Board Game Geek. There are 51 unique game mechanics on BGG, so that’s LESS than one a week. Totally do-able, right?! Of course, I promptly forgot all about that idea, until I stumbled onto the first couple in my design notes earlier today. 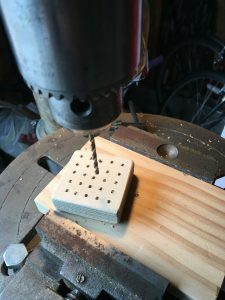 I spent some time subsequently flushing them out and writing a couple more, and so without further ado, here is a link to the in-progress results: pyramid games for every BGG mechanic. So far (as of this blog post) there are only 4 rule-sets in a “completed” state. I have notes for two others, but they haven’t been written up yet, which means they may not even be playable. At least one of those not yet present require a custom game board (the one for Roll-and-Move). Acting mechanic — In this game, players take turns choosing a board game, and without revealing that game’s name, set up and play that game with looney pyramids. They cannot talk, and the other players must try and guess which game they are playing. Subsequent players cannot choose the a game that has been previously selected. Action / Movement Programming mechanic — This game is a combination of seeing patterns in pyramids and using your hand to manipulate pieces on the gameboard. Game play happens in rounds where a “goal pattern” is decided, and players then simultaneously try and choose actions that will manipulate the board to create the “goal pattern” there. Action Point Allowance System mechanic — This abstract strategy game is played with 4 action points per turn. (With the first player only allowed 2 points.) 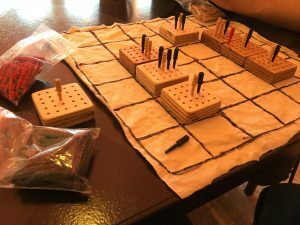 Some suitable small grid is chosen for the playing field, and each player takes a “stash” of icehouse pyramids and takes turns playing pieces onto the gameboard. At the end of the game, the board is scored and players win based on number of pips that are visible in their color. Area Control / Area Influence mechanic — This 2-player go-like game is played on a board created with pyramid cards. Cards make up the gameboard, and pieces are placed to “secure” the territory. This is the game I’m most excited about / interested in playtesting. I’ll post again about this project after I make more progress. I had a strange idea this morning. “What if every time you moved a piece in a game, you were also moving one of your opponent’s pieces?” I don’t know of any other games that have this same mechanic. 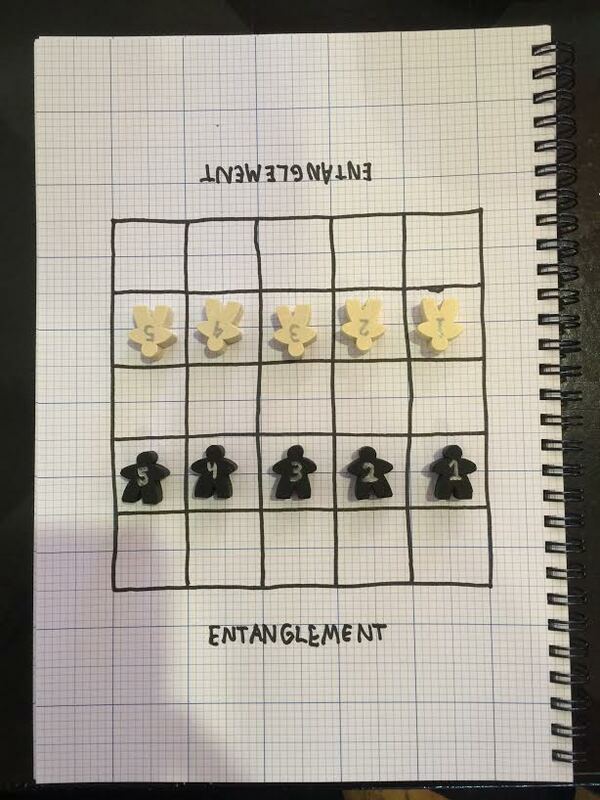 I present for you here, a very simple abstract small-grid game I’m calling Entanglement. Edit: A bit more details about how this came about and playtesting (over lunch) with my friend Nate. Usually when I have an idea for a new game, I enter some minor details in a google-doc/journal I keep for that purpose. I make sure to record the date, and what I was doing when I came up with the idea. In this case, it was such a simple idea, the game came to me practically fully formed, and I went straight to a new file to write out the rules. I jotted them down in about 20 minutes, and got back to work. Then over lunch I played the game a couple of times with Nate, and immediately it felt too complicated. (Which felt weird, because it was already SO simple!) So then I revised, and we played a few more games (without the variant rules listed in the .pdf). Overall, I don’t think this is one of my better games, it feels likely to be “solvable”, but it has some interesting decisions to make, and I was quite happy with my 10-minute prototype. If you play it, please let me know!